It has been back-breaking business, but I have finally finished building the raised beds for the back garden this weekend. 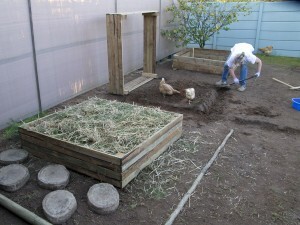 The chickens enjoyed the company and the new play area! I have filled the first bed with all the good and rich organic material. I have a friend that has horses and had straw bales for me! It is out-of-season, so they were more pricey than normal. But they are the best “brown” organic material to get hold of and they make for a neat covering. 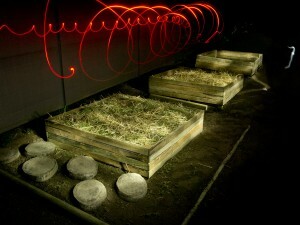 Hannes and I played around with light painting so we could add an unusual photo as well for you! Now I can concentrate on composting! I have learnt alot about this in my Organic Gardening Course I’ve been doing, so my next post will be on what I have learnt so far! 3 beds all in a row! The beds look great – I bet they’ll be bursting with crops soon! It is always great to see the results of somebody else’s hard work in the garden. It’s especially enjoyable when it’s a project that I’ve done myself, knowing the amount of work that’s gone into it. Now you just need to figure out how to light those beds permanently with those great light spirals. Excellent photo! I may start taking all of my “after” shots at night using this same technique. Hi Alan – yes, it was fun and incredibly rewarding! My hubby & I love painting with light! Try it! The effects are great! Well done my friend!! How long now before you can fill the beds with plants? Thanks my friend! Whew! It was a tough job to do on my own. I am “making” soil now, so I will prepare the beds for spring planting. Patience, patience! In the meantime I have the rest of the back garden to landscape…. thanks for your blog research! Wow, you did a great job! I love the night shot! hi barbara! nice beds you got there..have a great day!